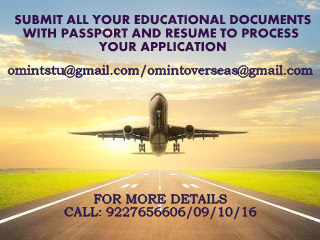 OM VISA Consultancy - Global Immigration, Students, Visitor, Business & Work VISA Consultants: grab the oppertunity to study in spp colleges of Canada, with the help of Om International the leading visa consultancy. grab the oppertunity to study in spp colleges of Canada, with the help of Om International the leading visa consultancy. Advantage of applying under SPP. · The students should have minimum of 50% or ‘C’ grade in their most recently completed degree/diploma. · Medical examination from an SPP approved physician is essential prior to submitting the visa application form. · Education loan from an Indian Chartered Bank is mandatory and 80% of tuition costs, living for 1 year and travel expenses should be covered from the loan. · More than 1 year gap after education is not recommended.